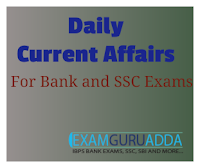 Dear Readers, we are presenting Daily Current Affairs for All Exams- 27th November 2016. 1. Former Hockey player Mariamma Koshy took charge of Hockey India as its president with immediate effect. Hockey India, during its 41st Hockey India Executive Board meet, announced that Koshy will head the national body. 2. Koshy, 63, succeeds Narinder Dhruv Batra, who in recent past was elected as the first ever non-European chief of the sport's governing body International Hockey Federation (FIH). Earlier in November 2016, Batra made history by becoming the first Indian and fifteenth president of FIH. 3. Batra served Hockey India as its secretary general from 2010 to 2014. He was serving the organsiation as its President since 2014. In addition, Secretary General of Hockey India, Mohd Mushtaque Ahmad took over as the chairman of the Hockey India League Governing Board. 1. Death Under The Deodars: Ruskin Bond.The much-popular writer, storyteller Ruskin Bond has returned after a long sabbatical with a brand new collection of stories titled ‘Death under the Deodars: The Adventures of Miss Ripley-Bean’. 2. The book consisting of 8 fresh thriller stories is set in the popular holiday destination, Mussoorie, in the bygone era of 1960-70. Through the stories, the writer narrates a murder mystery featuring an elderly woman- Miss Ripley-Bean and her friends. 3. It has been published by Penguin India. 1. Telecom operator Bharti Airtel today said it has acquired the 4.2 per cent stake held by Econet Wireless in its Nigerian arm. 2. Bharti Airtel International (Netherlands) BV through its wholly owned subsidiary, has completed the acquisition of Econet Wireless Limited’s entire 4.2 per cent shareholding in Airtel Nigeria. 3. After acquiring Zain’s telecom business for $10.7 billion in 2010, Airtel ran into a dispute with Econet Wireless —— a minority stakeholder in Zain Telecom. 4. Earlier this month, Airtel said its subsidiary has reached an agreement with Zain Telecom, pursuant to which Zain is to pay Airtel approximately $129 million for the settlement of all of Airtel’s claims on account of the Nigeria litigation, certain tax matters and associated legal costs. 1. Olympic silver-medallist P V Sindhu’s quest for a second successive women’s singles title ended in disappointment after she went down in straight games to Chinese Taipei’s Tai Tzu Ying in the Hong Kong Open Super Series final. 2. The Indian lost 15—21 17—21 in a clash which lasted 41 minutes. It was sweet revenge for Tzu Ying, who had lost to Sindhu most recently in the Rio Olympic Games. She now leads 5—3 in the head—to—head record against the Indian. 1. Indian teen golfer Aditi Ashok shot a final round of three-under 69 on a weather-hit last day to notch up her second successive victory on the Ladies European Tour at the inaugural Qatar Ladies Open.